First mentioned in AD42, but probably known earlier, parsley was favoured by the ancient Greeks and Romans as a medicinal herb and a food garnish. Native to Europe and the eastern Mediterranean region, parsley belongs to the carrot family of plants and is widely cultivated worldwide. It’s the most popular garden herb in Europe. Parsley is one of the first herbs to appear in spring each year. 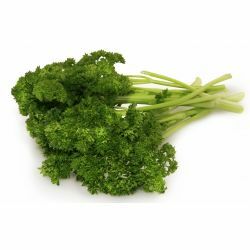 The parsley leaves are picked before flowering and are used fresh, frozen, as juice or dried. Parsley oil is distilled from the leaves and seeds and is used as flavouring in food and in men’s perfumes. Used in salsa verde, tabouleh and many other distinctive dishes, parsley is also popular as a breath freshener due to its ability to mask strong odours. Contains vitamins A, C, E, chlorophyllin and plant flavonoids, giving it antioxidant and anti-inflammatory properties. The seeds, roots and leaves are all used in herbal medicine. We use parsley leaves in our Brazened Honey face mask for its antioxidant and calming qualities.